Forty years after Dr Beeching swung his axe and slashed train services across the country, a new government report says the old Spen Valley line could be brought back into use. The Countryside Agency unveiled its report – Railway Re-openings in Yorkshire and the Humber – yesterday at the Metropole Hotel in Leeds, looking at the region's disused railways and assessing whether they have a future in an expanded rail network. Among those identified as having potential for re-opening is the Spen Valley line which was a victim of the Beeching cuts – though sporadic freight use continued until 1981. However, the report stresses that if the line did re-open it would be unlikely to be within the next decade, and it would have to take account of its existing use as the Spen Valley Greenway ensuring the two can operate side by side. The route extends from Low Moor on the Bradford/Halifax line, to Thornhill Junction on the Mirfield/Wakefield line, opening countless destination possibilities for passengers. The report says: "Re-opening would undoubtedly bring benefits in terms of a fast link between Bradford and the Heavy Woollen towns. 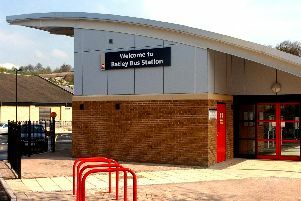 The service could extend to either Wakefield or (using a re-opened Crigglestone Curve) run through to Barnsley or Sheffield. This would give a more strategic link between Bradford and Sheffield. "The route's problem is that it does not get people where they really want to go – Leeds. This could be overcome by constructing a new curve where the line goes under the Ravensthorpe to Dewsbury line, but costs would be high." It adds that if it were developed for heavy rail it could lead to improved links to Bradford, Barnsley and Sheffield. However it is more likely that light rail – or tram – use would be the preferred option. The report has been welcomed by the Greenway's owners Sustrans, transport pressure group Missing Link, MP Mike Wood and the Greenway Forum who have all campaigned for the line to remain intact for possible future rail use. Mr Wood set up the forum to protect the line and stop it being sold off piecemeal after the owners – railway museum Transperience – went into receivership in the 1990s. The land was sold to Sustrans and the Greenway was developed. A spokesman for Mr Wood said: "The report is very good, well written and well argued. This is the way forward for sustainable transport and we are pleased the Spen Valley line features as a line ripe for re-opening. "The forum was convened to safeguard the line with the aim that sometime in the future it would be possible to re-open it as a railway and it would run in conjunction with the Greenway. One of the things that will worry people is that we have this lovely cycle path and are they going to tear it up, but that will not be the case. The report clearly says that it is possible to run the two together. "Opening it up would be incredibly beneficial. It would take a lot of traffic off the road – alleviating problems particularly in Heckmondwike – and it be good for economic development." Michael Ramsden from Missing Link – set up to campaign for a line to be reinstated in Spen – said: "I view Beeching as a huge mistake. Many people felt the same and said so at the time. "A light rail hybrid with frequent services would be most appropriate for the Spen Valley line which would have a shared used with the cyclepath. Some of these hybrids can run on a street system and also share tracks with heavy rail which would mean you could also have a service going through to Sheffield. "This report backs up what Missing Link has been saying all along, which people dismissed as pie in the sky." Regional manager for Sustrans David Hall said: "The reason this route can be considered for railway reinvestment is because Sustrans protected it. Without Sustrans and the conversion to the Greenway this line would no longer exist. "If there is to be a true railway renaissance we had better start protecting what remains of the last railway infrastructures and Sustrans have come up with a very successful way of doing that. "It is then a question of whether a case can be put for what would be a huge public investment. It might be 10 years away but in the meantime the route is not only being protected, but being hugely well used and enjoyed." Chairman of the Greenway Forum Donal O'Driscoll said he was pleased with the initiative. "The Greenway has now become such an asset that what I really hope is that a rail service could be developed in harmony with it, and that it would be a light railway which was quiet because we have got so used to it being peaceful on there."